Today Sunil and me finished our second day of diving in Pattaya and we finished it around the so called far islands and to be precise Koh Rin and North Rock aka 'the jewel of Pattaya'. More of that later, first to the story of our first days diving. It's been over a year that I've dived the Hardeep, as pictured above and with a great and accurate description and history on my friend Steve Burton's website thaiwreckdiver dot com of the Steamship Suddhadib, which is it's real name. As a side note, today it's exactly 65 years ago that the Hardeep went down on 1st June 1945! When we splashed for the first dive we had a moderate current but very low visibility and we got slightly disorientated, so I decided to follow a set of fins to the boat. 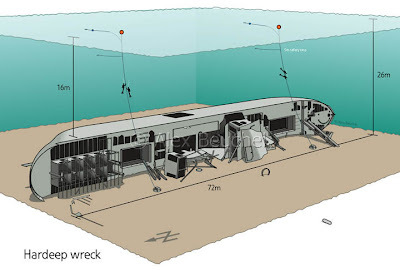 When we went gradually deeper and deeper, until we hit 27 meters instead of the expected 22 where the wreck is, I knew that we where on our way to the bombs near the wreck. Once we got there, Sunil indicated that he was rather not looking at unexploded bombs, so we made our way back to the wreck where we completed the skills required for the dive, which includes tying a reel off for later penetration, as pictured above. Once it was time to leave the wreck, we got disorientated a second time due to the low visibility and we couldn't find the ascent line, so we tied ourselves on to wreck with a reel and reeled off from the wreck to the surface. Upon surfacing we saw that the boat wasn't too far away from so we could actually swim back to it. When we jumped in for the second dive, Sunil, who had never dived in currents like this, decided that for the second dive he rather gave it a miss than trying to go down in an absolute ripping current, so we passed on the second dive on the Hardeep for that day, which was a wise decision to be made by Sunil. If you're not comfortable doing a dive, don't do it, it's as simple as that. We did however complete the Nitrox instructor training as well, since we did dive using a 36% Nitrox mix. Upon checking the tidal charts for the next day, we decided to change our destination to the far islands instead of returning to the Hardeep, since the charts predicted even stronger currents. We'll continue Sunil's wreck dive instructor course in Dubai somewhere in December, when I'm planning to visit there. Here's a view of the small harbour of Samea San with it's fishing boat fleet, where all the trips for the Hardeep start from, about a 45 minute drive from Pattaya. Today's diving took place at the far islands, the first dive around Koh Rin, where we completed the DUP speciality and during the second dive we completed the Fish ID speciality. The picture above shows a rather large puffer fish which we encountered during the second dive around North Rock, which is also know as 'The jewel of Pattaya' and a good dive it was indeed. We drifted serenely around the island, so it was almost like the Drift dive speciality, making it a very enjoyable dive and day all around. However, just as reported recently from Chaweng Beach and it's coral bleaching, here's a sample from North Rock which had it's share of bleaching, although not as bad as around Samui's and Koh Tao's dive sites.